This year for our Halloween Dinner, I made a whole menu of spooky dishes. 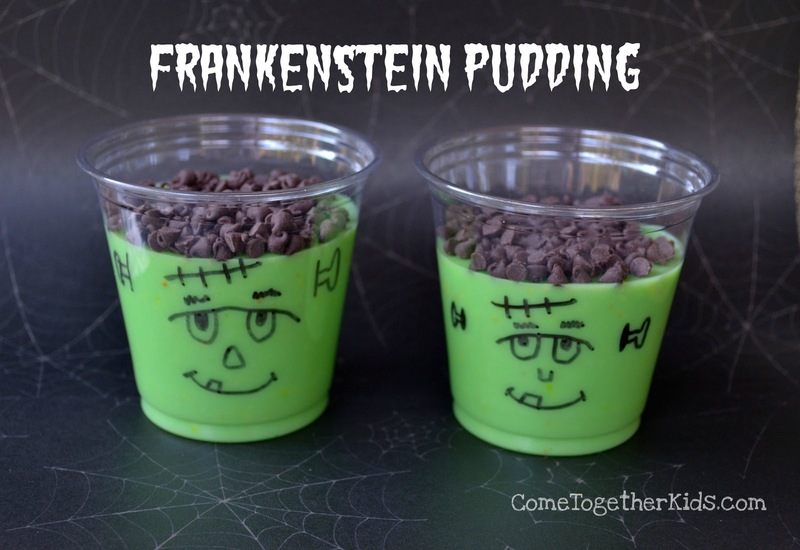 Inspired by the Easy and Fun Monster Meal that chicken babies linked up to our Halloween Party (and I featured in this Five Fun Ideas post), I had several different foods each with a gruesome twist. It was spur-of-the-moment, but super easy ~ I did the whole thing (shopping and all) in just a couple hours in the afternoon after I got off work and before the kids got home from school. The kids started calling it the "Mom-ster Cafe" ~ they're more clever than I am! 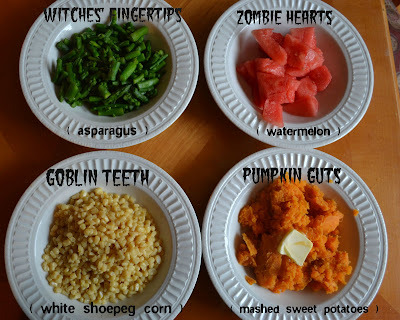 SIDE DISHES: Witches' Fingertips, Zombie Hearts, Goblin Teeth, Pumpkin Guts and Snake Eggs in Swamp Slime! I used the melon fusion flavor ~ nice swamp-y color and tastier than lime! 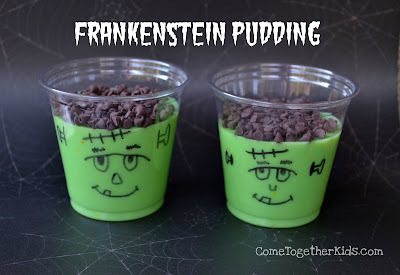 Vanilla pudding tinted green and chocolate chips with a Frankenstein face drawn on the cup. 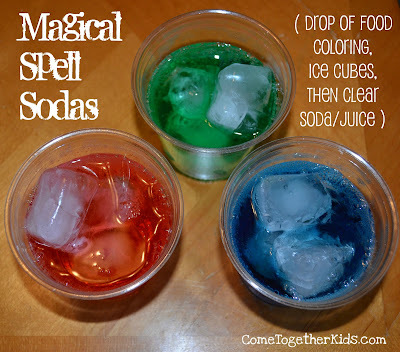 The kids LOVED seeing what color their drink turned when I poured in the Sprite. Needless to say, the kids LOVED it! I had them dress in their costumes for dinner and I tried to speak in a spooky voice while taking their orders and serving each dish. 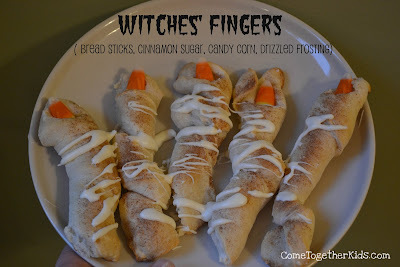 They actually ate everything ( calling asparagus Witches' Fingertips really worked magic ) and even had seconds on several things. 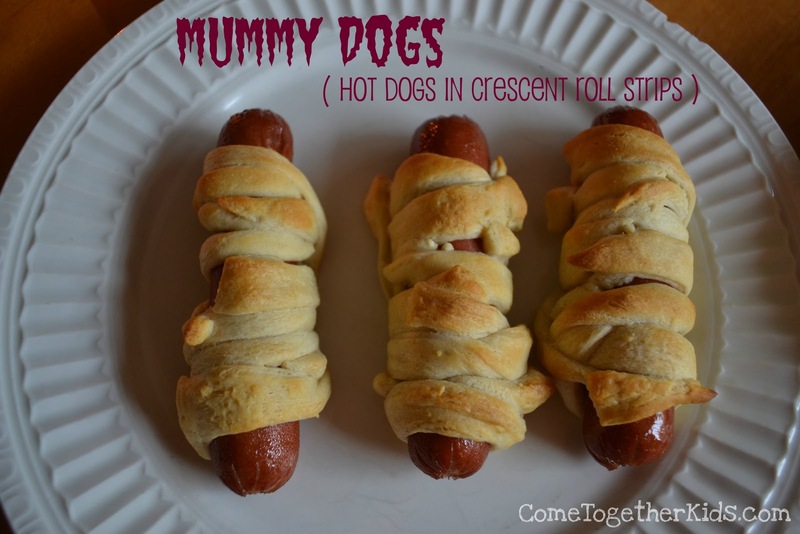 Mmm, Mummy Dogs, Goblin Teeth and Witches' Fingertips! 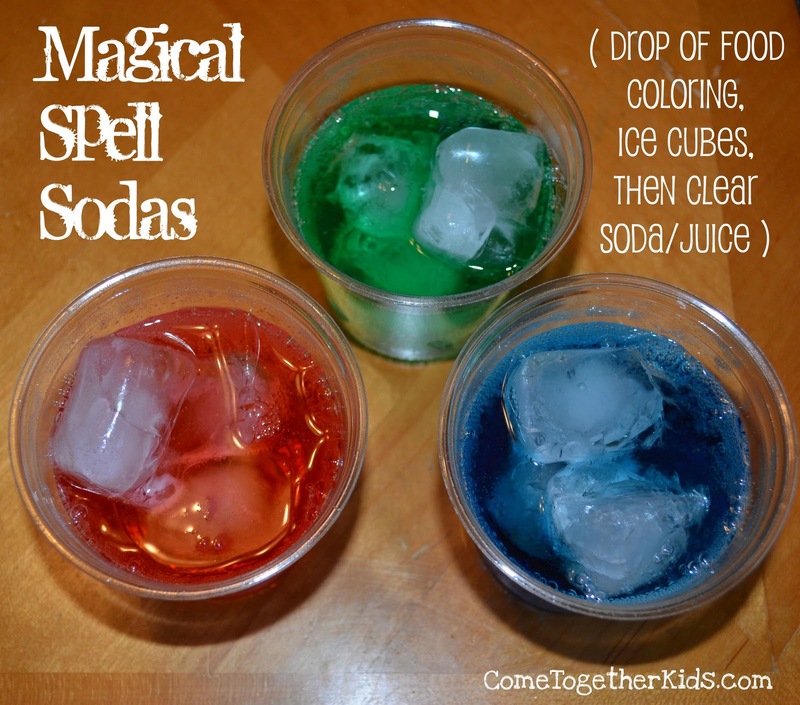 What kind of spell turned my soda green? 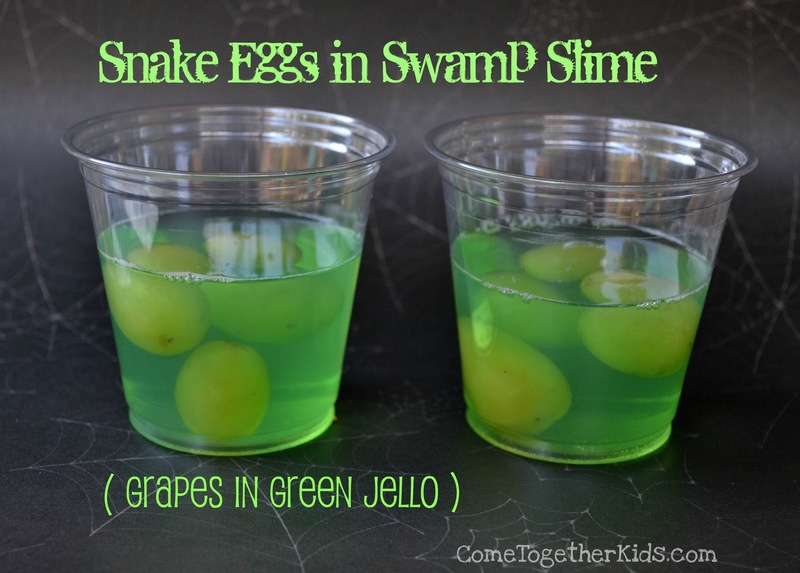 Snake Eggs in Swamp Slime? Quite yummy! Pudding with chocolate chips is a great dessert. Without a doubt, I'll be doing something similar next year! how fun!! i made a one eyed one horned flying purple people eater pizza. the kids loved looking at it but were a little hesitant about eating it:) you just never know what they are going to like. That looks like such a fun dinner! I love that they ate their asparagus too:) The snake eyes in swamp slime is my favorite for sure! Oh my goodness, you went all out! I loved the menu! Oooh. I like the slimy snails. Thanks for the shout out! Sharing ideas is fun. That is so adorable! It's amazing that you pulled that off in just a couple of hours! 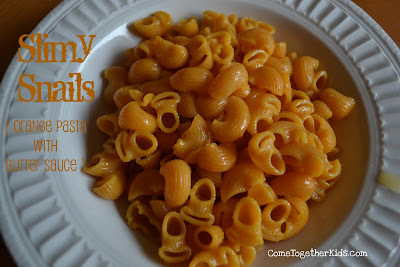 It turned out really great and I'm sure your kids had such a fun time. They'll remember that always, I bet. You're so fun!! I've pinned this and I'll be sharing it on my facebook page. Thank you for sharing! We have to do this next year. Oh, this looks way fun. And I love that they ate everything. I've got to try this out next year. I have bookmarked it and I will share on FB as well. How fun!! Looks like everyone loved it! This is so cute and precious. It's too late this year, but next year I would like to do this for my son and his friends! You are such a fun mom! I hate the kitchen so this would never happen in my home. I want to send my kids to you next Halloween so they can enjoy this! I truly saying that you are fun mother, lots of great knowledge you have to do a Halloween and other parties. Sweet little faces, which makes your party more wonderful. good IMO is encrypted style it gives effective safety to your information. Download IMO support group if you have any issues with Andy OS installation procedure nice. good dump Blackberry because of the Board of Blackberry does WhatsApp Messenger videos, papers, audio, get in touches with and also area nice. the versions of WhatsApp that have actually been launched WhatsApp Set up WhatsApp on your apple iphone. Even if you have. These are commenters who don’t contribute to the conversation, but say something like “Great post!” while leaving links back to their own blog or site. Sometimes this practice can feel like spam if it happens often enough. Buruan gabung dan daftarkan diri Anda Jangan sampai.. Disini Anda Dapat Menemukan Agency Resmi terbaik dan terpercaya.